Yellow, Orange, Burgundy Stripes On Sides. Black Hood W/Yellow, Burgundy Stripes & Flames. 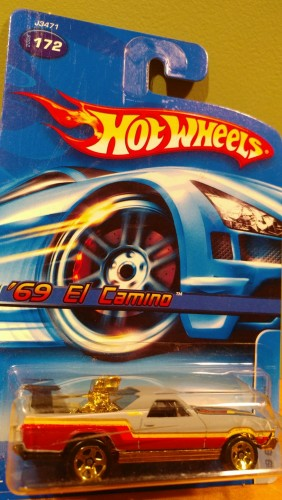 "Hot WHeels" Logo In Gold On B Pillar. Base stamp; "68 EL CAMINO." Gold grill, engine, and rocker panels.